In many of the places I have worked people have put time and effort into developing new products, new services etc…solely in response to the competitive environment, such as new competitor products or pricing structures. Obviously it’s important to respond to what’s going on ‘out there’ but often the money and manpower allocated to the ‘new’ propositions takes resource away from the core products and services, which are often what you customers are really interested (especially in these straightened times). It can be a brave thing to do to when your competitors are rushing around with ‘new’ stuff to do what you already do, but better. It can lack visibility publicly, but won’t go unnoticed by your existing customers. Anyway, being a fan of wanky business-speak and aide memoirs, the idea of spending as much time critically examining your own business than other put me in mind of of lighthouse. It’s primary job is to look outwards and shine it’s light on potential danger, but for every sweep of its beam, it also casts its light internally, on land. 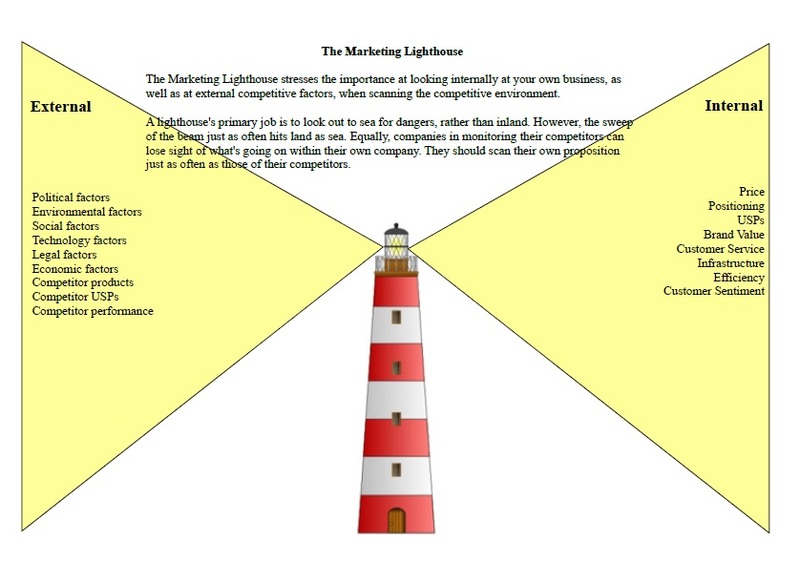 So, I give you – the Marketing Lighthouse! Gun control is pointless. It’s time for bullet control. Facebook flotation – there’s still gold in them thar e-hills. More money for more roads? Wrong solution to wrong problem.